All-in-one record player featuring built-in, high-performance stereo music system with high-quality phono components and advanced listening features. Plus Audio +Record Player System is an all in one turntable system featuring a truly high performance in built stereo speaker system. It includes Bluetooth and optical inputs and features two sound modes - a standard and a "wide" mode which offer truly room filling sound - one of the best all in one systems we've ever heard, with a beautiful walnut or maple wood finish. 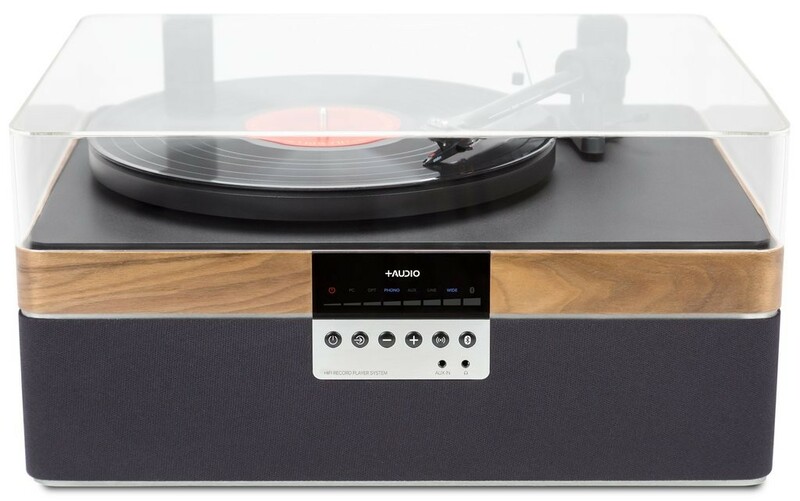 Innovative in design, the +Record Player is the first all-in-one phono system featuring a built-in, high-performance stereo speaker system, designed for the discerning vinyl enthusiasts. It features patent pending, revolutionary technology developed by Bob Hazelwood, challenging the principles of physics and acoustics in self-contained vinyl playback systems. This system allows for powerful, low-frequency reproduction (down to 50Hz) without disturbing resonances or distortions. 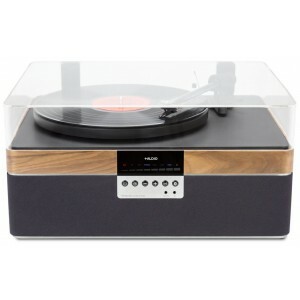 Not only does +Record Player include 33 and 45 rpm playback modes via electronic speed switching, the player includes Bluetooth for wireless streaming from digital devices, optical-in for TV connectivity, USB for vinyl ripping to PC, headphone output, and analogue input/ output to add a separate powered subwoofer or speakers. A 5V USB output powers your Chromecast, Echo Dot or Airport Express, enabling it to accommodate your favourite voice assistant or streaming device. 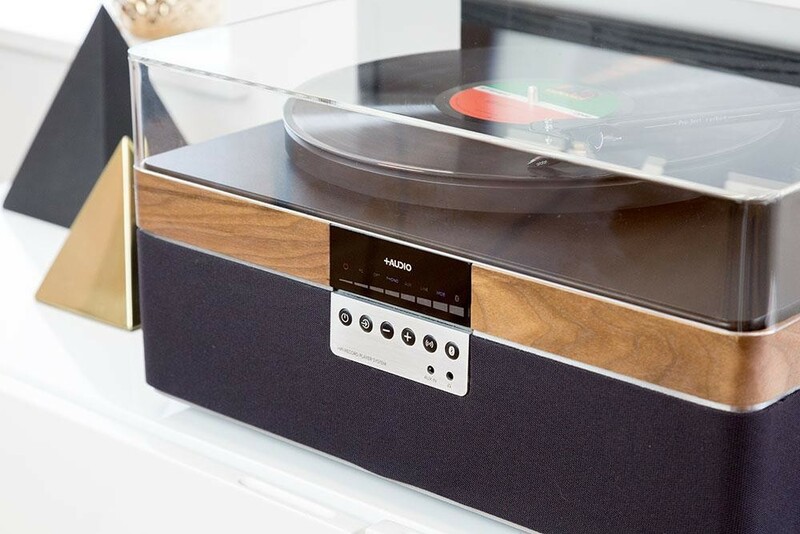 Enjoy your vinyl collection on a compact system with numerous listening features, audiophile-grade sound quality and a contemporary design, without the needing additional components. 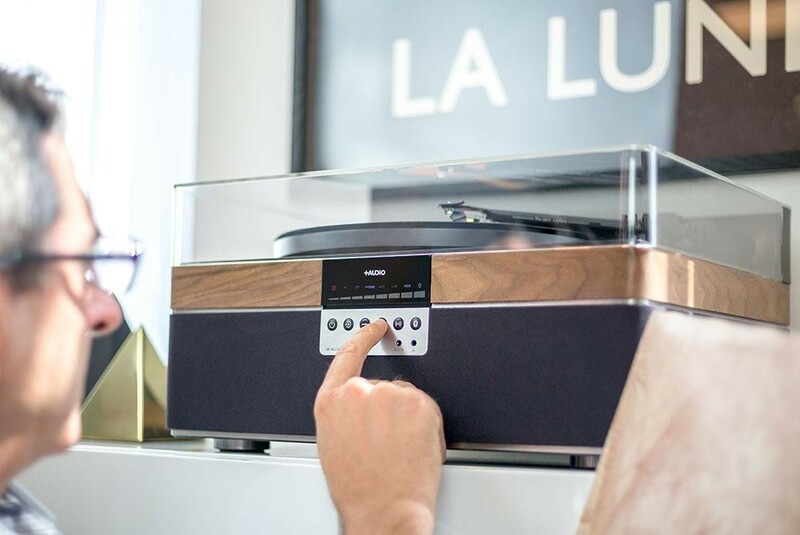 +Audio’s goal was to reimagine the record player system into a modern unit. It promotes a clean Scandinavian design, intuitive controls, and the modern functionality expected by serious music enthusiasts. The +Record Player features a timeless, understated look. Designer Alexander Åhnebrink incorporates genuine wood veneer, aluminium accents and other premium materials for sturdiness, sound quality and ensuring it looks as natural in your room as it sounds. The unit has a logical, no-fuss menu layout with intuitive access to different inputs, modes and volume controls. It's all about getting you to the music, with easy volume adjustment, and quick switching between phono, Bluetooth and other inputs. +Record Player eliminates acoustic feedback without limiting bass-performance using a multi-faceted approach comprising; designing a unique four-speaker array, developing a special enclosure construction and bracing technique as well as using latest DSP processing. To overcome the lack of stereo separation typically found in all-in-one audio systems, +Audio developed a wide listening mode. Your music is reproduced feedback-free in a high-definition wide-soundstage that resembles separate speakers. It’s a room-enveloping experience that brings your music to life, at both moderate volume or room-filling loudness. The +Record Player delivers the effortless, wide-range sense of detail, frequency range and clarity typical of only separate, high-end component systems. This unit includes critically acclaimed components selected for quality and performance. The turntable is a high-quality, European belt-drive model from Pro-Ject. It features an award-winning light-tracking Ortofon cartridge which provides musically expressive accuracy. The +Record Player features an ultra-low noise pre-amplifier with highly precise two-stage architecture and passive equalization, like many high-end separate component pre-amps. Each speaker driver is driven by its own dedicated amplifier channel, with discrete sonic contouring made possible by advanced DSP processing. The result is a coherent sonic blend between each driver, not achievable by traditional passive-crossovers. Achieving good bass in a small enclosure is a difficult task. For this, +Audio developed a specially designed, compact long-throw aluminium-cone woofer that performs as well as larger conventional woofers. To fill out the high end with silky detail, 1” soft-dome tweeters are used, each with their own chamber. 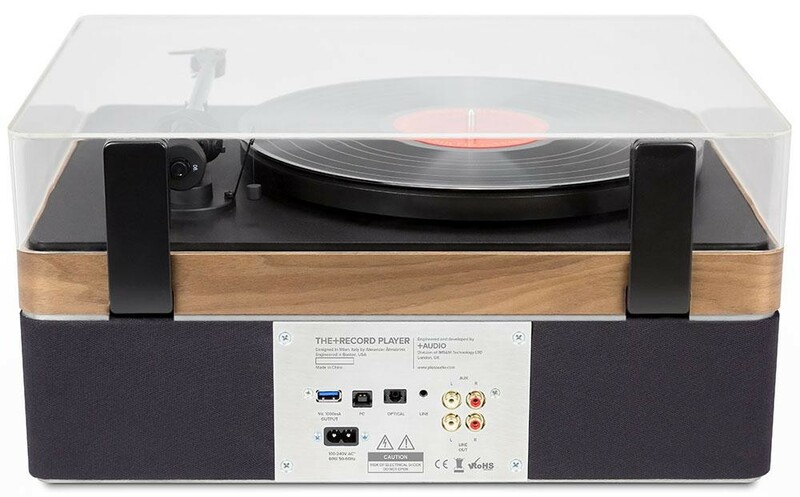 The +Record Player has 100W (MAX), giving you upwards of 110dB+ of output. That's more than enough for any party, and with no acoustic feedback when playing records.